Although the area has something to offer all year round as the seasons change our favourite time of year to visit is definitely autumn. 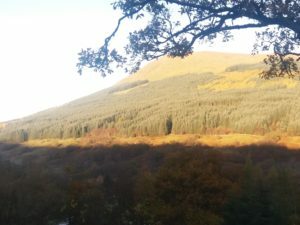 There is something magical about the variety of colours as the leaves turn from green to various shades of brown and red, and the bracken turns brown too. 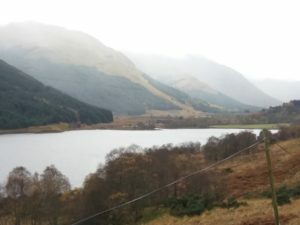 Here is the view over Loch Voil (just a few miles along the glen from here) earlier today, and there are many other spectacular views around here, including those from the cabin itself, as in the second image. If you take any photos we would love to have copies of them to add here – just attach them to an email or send by twitter. ← Have You Seen The Deer?